The SQA Annual Meeting is held, usually in March, April or May, in conjunction with the SQA Quality College. Together, they feature two days of pre-conference training, three days of conference sessions, and one and one half days of post-conference training. 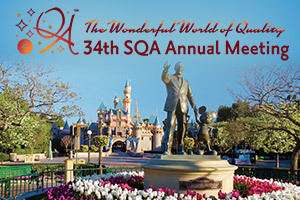 The SQA Annual Meeting and Quality College are dedicated to promoting and advancing the principles and knowledge of quality assurance essential to human, animal and environmental health worldwide. The program is of interest to QA professionals, management, study personnel and regulatory authorities around the world. SQA Annual Meeting presentations with synchronized audio may be purchased through the Annual Meeting Online Library.